In 2007, I reviewed a title called HISTORY DUDES: EGYPTIANS published by DK. I enjoyed the book but gave it a Recommended with Reservations because it was designed for ages 9-12 but had some curse words in it (hell and damn). The recommendation has bothered me ever since because I know some of the books in my school library have those same words in it. I know most of my students hear those words at home on a regular basis and most parents would be completely unconcerned. I am unconcerned when it comes to my own daughter reading this series. I am quite liberal in what I allow my own child to read. However, I also know there are some very protective parents in my community who would object. A parent once told me –– upon learning her child said the s-word in my class –– that she sat her kindergartner down and instructed the child that God would send her to hell to burn for eternity for using profanity. So sometimes I am a bit conservative in my recommendations even if my own personal views are much more liberal. I try to balance those recommendations with honest and detailed reviews so teachers can make decisions based on their own communities and cultures. Because it has long bothered me, I have decided to modify the recommendation for HISTORY DUDES: EGYPTIANS. While contemplating that move, I figured I might as well take a stab at HISTORY DUDES: VIKINGS. The use of profanity is less in this title: a “hell-bent”, a “pain in the asp” reference to a snake story (which I found funny), and the historical mention of the use of ale. The historical information in this nonfiction book far outweighs any minor language. 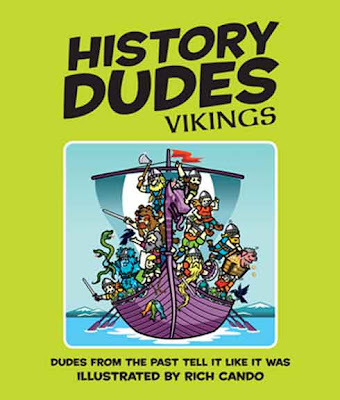 HISTORY DUDES: VIKINGS is a jocular encyclopedia of all things Viking. Raids, weapons, ships, clothing, culture, laws, homes, food preparation, jobs, gods, burial rites, colonization, and several stories of real Vikings are all combined in what is actually an illustrated encyclopedia which uses comic elements –– panels and dialogue bubbles. It’s not actually a comic. HISTORY DUDES hammers at a niche of young readers who, for the most part, are often overlooked. It is nonfiction and humor combined to envelop kids who find no interest in fictional stories. Kids will laugh, especially at the more controversial parts, and find their place in the world of reading for enjoyment.